Wow!! We now have two locations to serve you! At our stores you will be intrigued by our amazing selection with both stores offering over 13000 square foot of pottery and paver display. With the largest selection in the state of Florida, you will find beautiful high end glazed pottery and fountains at below retail prices, Chimeneas, statues, and one of a kind garden decor. You will always be greeted with a smile and personal one on one attention, whether you are shopping for accessories or discussing your new hardscape design. Curb Appeal has grown over the years, starting at the Market in 2008, we grew so large we opened our first Outdoor Design Center in September 2012 located in South Daytona. In our South Daytona Store will find new and exciting products and many ideas you can apply to your outdoor living space. Continuing to grow, we opened our new Ormond Store in March of 2014. In Ormond you will see a wonderful outdoor living display with an outdoor fireplace, firepits and a summer kitchen.Not to mention our huge selection of pottery, fountains, garden decor, and pavers. 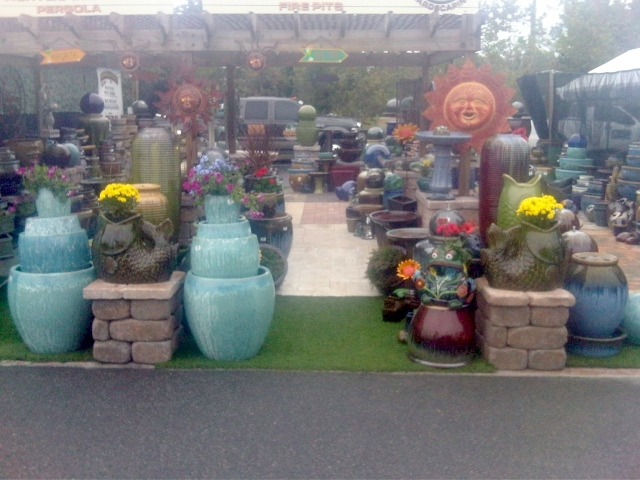 Come out and visit us at either location and you will surely find the perfect addition to your home and patio. Curb Appeal Hardscaping is a family owned and operated paver company offering the finest pottery and garden decor in the Daytona Beach Area. We are a full service design and build company who has been serving this area for over 10 years. Curb Appeal Hardscaping is a "One Stop Shop" for all your outdoor needs. We are college educated with Bachelors degrees in business with a minor in Horticulture and Landscape Design. With our knowledge and guidance you can have the home of your dreams. "Add Value to Your Home with CURB APPEAL!"